Since I started working as a massage therapist, one of the most common areas of concern for the modern day client is the shoulder/neck area. Every week, at least one client will comment on issues in the upper body area. Sometimes it is posture, other times it is stress, fatigue or emotional issues. Posture can be inherited or developed from an unnatural everyday position, or as a result of a trauma e.g. accident or injury. Consider the forward head posture when someone is on the phone, with the phone to the ear, or texting with neck flexed forward & down. Same unnatural posture applies to using a laptop, especially when lying in bed, or sitting on a sofa. Guilty. 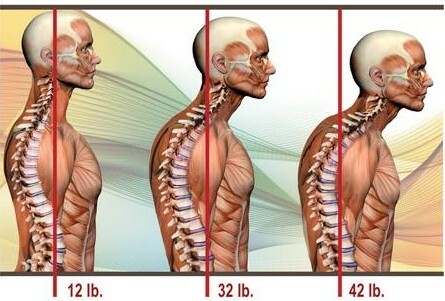 These unnatural everyday postures affect the Neck, Arms, Shoulder & Hip (NASH). In the long term, the shoulders can become elevated or rounded. The neck can become flexed in a forward head posture, and the hip flexors can become shortened pulling the hip too far into a frontal plane. Sleep position too can have both a long term and a short term effect on posture. Some clients really like memory foam pillows and others don’t. Any pillow should provide gentle support to the head in order to allow the neck muscles to relax and switch off. The Alexander Technique is a very good method to research how head position affects health. Emotional factors can contribute a lot to posture. Feeling a lot of responsibility or “the weight of the world” on the shoulders can tense the area. An environment where positive thoughts & energy from a massage therapist can help a client concentrate on the area of tension, with support can work wonders on the area. Combined with a balm (no showering that evening) e.g. tiger balm to soak through the muscles via the skin overnight, can help relieve tension, stress & worry. To try a balmy massage contact www.NEEBA.ie. Heat therapy can be very useful too, either with stones, or a hot towel placed on the shoulders after the massage is very reassuring & comforting. The following diagram gives an idea of how long-term postural weakness can lead to chronic skeleton-muscular difficulties. This modern day posture picture shows how the Angle of Compression can degenerate to ultimately effect the sinuses, and the nasal cavities. The increased pressure and strain on the neck can lead to problems with the jaw, gums & even ears.Strain on the neck has been known to be responsible for headaches, and even depression – as the angle can put pressure on areas in the midbrain. Thoracic Outlet Syndrome can develop. A therapist may first assesses a client with postural problems, then without regular treatments, a condition if untreated or unchecked, can over a few years present as depression. This stooped postural angle can lead also long-term to breathing issues as the diaphragm is compressed and pressure is exerted on the ribs, sternum (or breastbone), and chest cavity. Yoga & mindfulness are both very useful for drawing the client’s attention to their breathing patterns. Shallow breathing is a symptom of modern day living as we need to remember to stop & “take it in”. The hours and hours that a student may spend in this position may squeeze the digestive organs too, leaving the stomach & colon under pressure with less space for peristalsis to gentle move the contents of the small & large intestines along the digestive tract. If the muscles in the back are allowing to remain in an overextended position for long periods of time, and the muscles at the front of the chest are tight, they loosen & weaken. Exercises may be advised by the massage therapist to strengthen these muscles again, as the massage will help loosen them at the front. Only when the frontal muscles are loosened, then can the muscles e.g. Rhomboids be strengthened to help draw the shoulders and arms back into the correct postural position. If this does not happen, the hip bones may also be displaced by tight hip flexors, and with the same principle, loose hip extensors e.g. glutes & hamstrings. Extreme weakening of the shoulder muscles at the back may lead to a pattern called a winged scapula where the scapula can be seen to protrude out of position at the back.